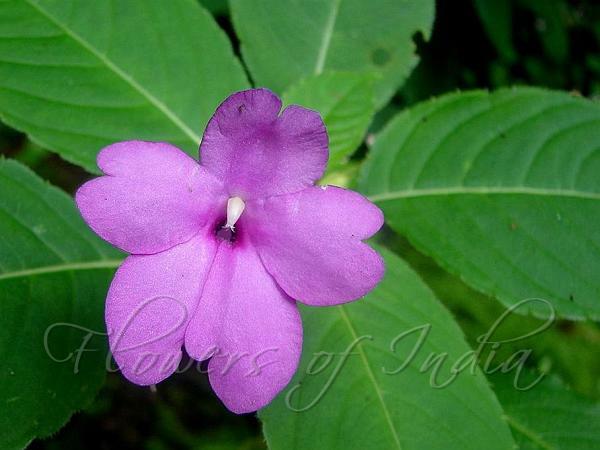 True to its name, Handsome Flowered Balsam is one of the finest of the Indian Balsams. It is an annual herb, 40-60 cm tall, with erect succulent stems, swollen at nodes. Alternately arranged elliptic membranous leaves are 7-12 cm long. Leaf margins are serrated, and the leaft stalk is 2-4 cm. Flowers occur in leaf axils, on stalks 5-8 cm long, 2-3 together. Violet purple flowers are 4-5 cm across. Standard petal is round, notched, spurred at the back. Wing petals are broad. Lip is short, boat-shaped. Spur is long and curved. Capsules 1.5 cm long. 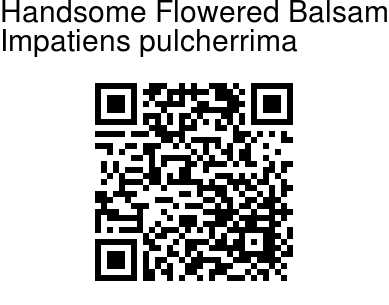 Occurs on slopes of forested hills above 1000 m. Unlike other balsams, this one is not geragrious. Flowering: August-October.